A former NHS manager who used knitting to de-stress has secured a contract to sell her wool products to John Lewis. 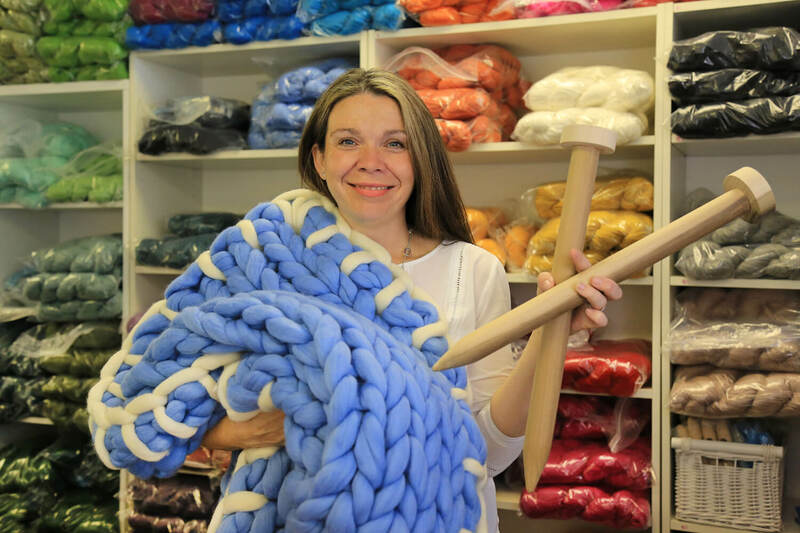 Claire Gelder, who has moved her business into new premises in Barnsley, quit her high-pressure NHS job to set up Wool Couture. The company creates DIY knitting packs with giant needles and giant yarn, and also sells Merino wool yarn, handmade crochet hooks, and chunky scarves, hats, blankets and dog beds made by an army of knitters. The company has just moved into the 500 sq ft office at the Barnsley Business and Innovation Centre (BBIC), at Wilthorpe, and is now receiving support from Enterprising Barnsley, the economic development arm of Barnsley Council, which provides specialist support to businesses with growth potential. John Lewis will retail the nine different DIY kits that Wool Couture creates. These include one for a chunky throw, which uses 50cm long knitting needles; a pom-pom hat that takes just two to three hours to make, and scarves which are knitted by hand in just half an hour. The kits will be sold at its Oxford Street store and online. Claire said: “Normal knitting means it can take six months to knit a scarf and I can’t wait six months for something to be done, I wanted it to be done in a weekend. “So I started with small needles and then they just got bigger and bigger; until we ended up with ones that we made ourselves and are up to one metre long. The Merino wool, which is imported from South America and South Africa, is coloured and baled in Yorkshire. The giant needles are made from tulipwood, which is light enough to be handled even if the needles are up to one metre long. Wood turner Rob Ing makes 120 pairs of giant needles a week in Claire’s converted garage at her home in Wakefield. “I was about ten when someone gave me a crochet hook and I was literally hooked,” said 43-year-old Claire. “Since then I have always knitted or crocheted and when I was really under pressure at work I would come home and pick up the needles. Claire started her career working in the private sector for blue chip companies, before bringing up two children with health issues made her see the value of the NHS. She then worked for 15 years for the NHS in improvement, culminating in a role where she was director of transformation for a clinical commissioning unit. But her hobby changed her life about 12 months ago. The success prompted Claire at the age of 42, to take what she describes as a “huge leap of faith” to volunteer for redundancy. She set up Wool Couture and a health innovation centre at the same time. But with the orders coming in Claire soon decided to concentrate on Wool Couture. The company now has two other employees and various sub-contractors including a team of ten knitters. Wool Couture is receiving business support via the Sheffield City Region Launchpad scheme, a programme of start-up support for new companies being delivered through the Sheffield City Region Growth Hub and led by Enterprising Barnsley. Launchpad workshops and seminars are available to all businesses in Barnsley under two years old. Martin Beasley, of Enterprising Barnsley, said: “Wool Couture is the type of business we want to encourage in the borough. It’s brilliant that we have brought them here and now I am sure we will see them grow. BBIC is committed to assisting economic regeneration in the Barnsley borough. It aims to stimulate, promote and encourage the development of innovative technology and knowledge-based businesses in order to create jobs and economic growth. For further information about Enterprising Barnsley, please contact Martin Beasley on 01226 787545 or visit www.enterprisingbarnsley.co.uk.